First we look at the technical picture for overall context, and then drill down to the fundamentals behind it. Here’s the EURUSD weekly chart as of the end of last week. The EURUSD only partially recovered its prior week losses, creating a “lower high” that extends and reinforces the 6 week old descending channel. The 10 week EMA, our shortest, most sensitive to change, has turned downward. The bounce kept the pair from falling into the lower quarter of the double Bollinger bands, the ‘sell zone’ that suggests momentum is now downward and that the odds favor a deeper decline. Instead the pair returns to the safety of the middle ‘neutral zone’ that suggests the odds favor a flat trading range which is unlikely to be profitable for anyone but short term traders. 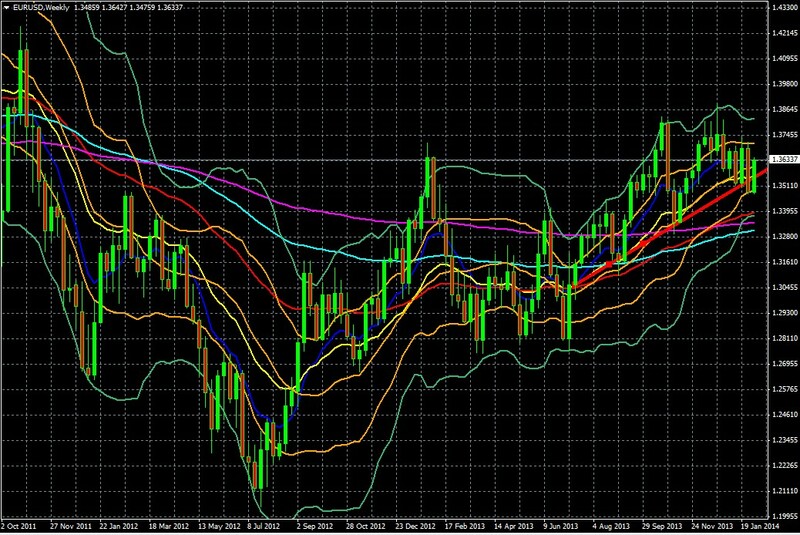 See here for a full explanation of how to use double Bollinger bands, one of the very most useful technical indicators. That bounce also gets the pair back over its medium term up trend line that began in mid-July 2013 (red). For reasons we discuss in depth in our book, our focus is on the medium and longer term holding periods that provide simpler, safer trading opportunites for most traders and give them a better chance of being in the small minority of consistently profitable traders. For the coming week assume more range trading within the 1.34720 – 1.37500 range. That’s wide enough for the shorter term traders using time daily and shorter time frames, but not for longer term traders. A decisive break over 1.37100 puts us back in the double Bollinger band buy zone, takes us over 5+ week resistance, and puts the odds in favor of a sustained move higher to test resistance in the 1.3870 area. A decisive move below the 1.34750 area puts us below 3 month old support and also puts us back into the double Bollinger band sell zone, making a test of 1.3350 resistance area likely (which is where 50 and 100 week EMAs converge, and which has proven a support/resistance area since June of 2013). So that’s the technical picture and some ideas on what to do with it. Now we drill down to look at the fundamentals behind it and that will drive it this week and beyond. General calming about the emerging markets (EMs), which allowed for a general stabilization and minor recovery in risk appetite as depicted by most of our sample US, European, and Asian indexes shown below. That said, the key take-away from the sample of leading global stock indexes shown below, which we use as global risk barometers for reasons covered here, is that the breakdown in the over 18 month up trend on the weekly charts halted this past week, but it did not reverse. We have calm, a temporary bottoming, but not a rebound. Not yet. In sum, the big developments in the US and EU were bullish for the EUR, bearish for the USD, while relative calm about the EM’s eliminated a big drag on risk appetite and allowed at least a moderate improvement in risk appetite that allowed the pair its minor recovery. Although the German Constitutional Court clearly doubts that the OMT is within the ECB’s powers, along with anything resembling a US-style QE, it avoided ruling against such moves. However, the court “also considers it possible that if the OMT Decision were interpreted restrictively,” it could be legal. The ECB tweeted that its Outright Monetary Transactions (OMT) program was within its mandate. The key takeaway is that Germany appears to be ceding its veto over some kind of EUR dilutive, inflation risking, expansion of the money supply. In the near term, that means little, as the ECB is not yet ready for such moves. However, as we have argued here, it’s just a matter of time before the EU must choose between some kind of large scale money supply creation, (be it technically money printing or not) and the EU’s survival in its current form. The unemployment rate continued to drop – it unexpectedly fell to 6.6% from 6.7%, even as more Americans enter the workforce, thus boosting the labor force participation rate to 63.0% from 62.8%. Average hourly earnings and the labor force participation rate increased. Jobs growth, and the recovery, are still continuing. During the past 6 months, the U.S. is still adding 177,500 jobs per month on average. Of equal importance, the report meant that the US has growth AND a lower chance that the Fed might accelerate the taper. The current rate of taper is priced in, however acceleration is not, and any such surprise could pressure risk assets and boost the USD. The 0.2% increase in average hourly earnings and the labor force participation rate suggests that jobs are paying better and that encourages people to return to the worker force. That explains how the broader and more reliable U6 unemployment rate also dropped from 13.1% to 12.7%, its lowest level since November 2008. Growth without faster taper: bullish for risk assets. In sum, markets got the bullish message of continued gradual recovery without the bearish increasing of odds of the FOMC announcing an accelerated taper. Instead, due to weaker job growth, the Fed is now more likely to amend its forward guidance as the unemployment rate has long passed the 7% rate that was supposed to signal the end of QE, and it now approaches their 6.5% threshold for accelerating the taper AND for discussing the pace and timing of actual interest rate hikes. Given the recent selloffs in risk assets, and their nascent rally Thursday and Friday, it seems that investors are still inclined to see the past weeks’ selloff as more of a buy the dip opportunity than a start of a more prolonged pullback, despite the technical damage to the leading global stock indexes shown above. What will the Fed do? Funny you should ask. This week Yellen gives her very first semi-annual testimony on the economy and monetary policy. Along with retail sales, it could be the biggest market mover on the US calendar. Which is more influential depends on which provides a bigger surprise. Here’s what you need to know about what could be the biggest market moving event of this week. Our first chance to hear Yellen’s interpretation of the data and here response to it is this week, when she gives her very first semi-annual testimony on the economy and monetary policy. She testifies before the House on Tuesday and Senate on Thursday. Her prepared remarks will be released 8:30am EST Tuesday, 90 minutes before she delivers her first policy address on the economy as Federal Reserve Chairman. She’ll be asked about what the Fed plans to do with their 6.5% unemployment rate threshold and most likely she’ll answer that the FOMC will reevaluate the forward guidance in March. As always, retail sales could also be a big market mover, given the ~70% of GDP that consumer spending comprises. It is expected to remain at only 0.2%, the same as in the previous month. A strong reading would usually be bullish for risk appetite and thus the pair, but now the likely market reaction is less certain. If markets interpret the result as they did the jobs reports – growth without higher risk of accelerated taper – that would be bullish for the EURUSD. An opposite interpretation would be bearish for it. Weak demand is another challenge that Yellen needs to address early in her term. China Data Dump: Trade balance is the big one. There’s also money supply, and new loans. Remember for all the blame placed on the Fed taper as a source of emerging market volatility, that China’s slowdown and policy moves, have been disruptive for EMs. Bullish results are bullish for the pair. In addition to the above mentioned retail sales and Yellen testimony, there’s weekly unemployment claims, which could be market moving only if it produces a major surprise. China: YOY CPI and PPI – given ongoing concerns about rates and liquidity, if this influences overall risk appetite it could move the EURUSD . US: Preliminary UoM consumer sentiment might matter if it sends a starkly different message than the actual retail sales data from Thursday. Given the US jobs reports, we don’t see the Fed accelerating the taper or making other surprise tightening moves at this time. That leaves a bout of stronger risk aversion as the USD’s best hope in the near term. Although our outlook for the coming week is neutral –bullish on the pair for reasons given above, our real time sample of retail traders (average holding period 8 weeks) from forexfactory.com shows a strong bearish shift. Last week they were 56% long, 44% short the pair, as discussed here. This week they’ve swung back to 37% long 63% short, a far more typical positioning ratio for the past months. Stay tuned for our posts on lessons for the coming week, key market movers, and a 2 minute drill overview of prior week market drivers here. 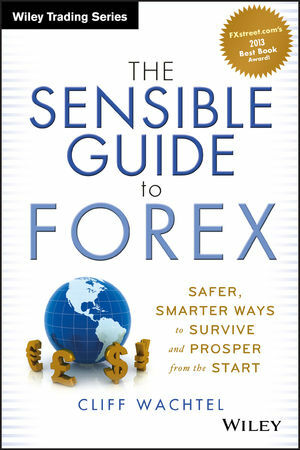 For full discussion of double Bollinger bands, the pros and cons of our safer, simpler longer term forex trading methods, take a free look at our book using the “Look Inside” feature here.